Egypt's Interior Minister Mahmoud Tawfik said Sunday, "Terrorism will not lessen our resolve," and that, "Officials will deal firmly against any deviation from the law." Tawfik's comments came during a meeting with security officials to discuss tightening security measures ahead of New Year and Coptic Christmas celebrations, a statement by the interior ministry read. The minister held a meeting with a number of security leaders at the Information and Crisis Management Centre at the ministry. He also discussed means of securing different governorates in a video conference with the heads of directorates across Egypt. Tawfik affirmed that the security officials will not hesitate to take measures to protect the country's security and stability. He stressed that the interior ministry will not allow the law to be broken and will deal with utmost firmness with any attempts to harm the security and safety of citizens. 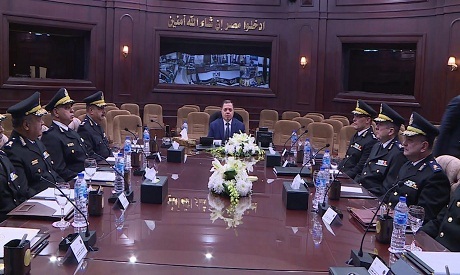 During the meeting, Tawfik praised security efforts exerted which brought stability to the Egyptian street and the restoration of national development efforts. The minister affirmed that preparations are underway to deploy security forces at places of worship, important installations and vital tourist destinations in the country during the holiday period. He stressed the importance of caution and vigilance while tightening efforts to secure vital facilities. The minister pointed to the readiness of security forces to deal with various emergency situations. He also stressed that the ministry's efforts in pre-emptive strikes against terrorist elements are continuing in coordination with all state bodies.